Housed in a former château, this guest house is located in the Midi-Pyrénées region and 15 km from Pamiers. It offers free Wi-Fi access in public areas, a garden and an outdoor swimming pool. All the heated rooms at Château de Gargas offer a wardrobe and a fan. They also have an open-plan bathroom with a shower. Some rooms feature exposed wooden beams or a claw-foot bath. Guests are invited to have a continental breakfast every morning at Château de Gargas. Local dishes are served on request. 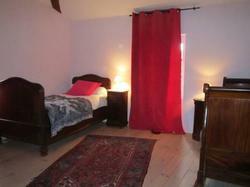 This guest house is 55 km from Carcassonne Airport and 14 km from the A66 motorway. Free private parking is available on site. This room has a sofa, a TV and a bathroom with a bath. This room has exposed beams and an open-plan bathroom with a bath. This spacious room has exposed beams, a balcony with garden and mountain views and an open-plan bathroom with a claw-foot bath. This spacious room with garden and mountain views has exposed beams, a four-poster bed and an open-plan bathroom with a claw-foot bath.